CFN - CALIFORNIA FIRE NEWS - CAL FIRE NEWS : Out of State - Idaho: Murphy Complex Fire - Wildland Fire - 649,131 acres with a 37 % containment. Out of State - Idaho: Murphy Complex Fire - Wildland Fire - 649,131 acres with a 37 % containment. Location: 30 miles southwest of Twin Falls, Idaho Fuel model: Model 5 with a mix of Juniper. Fire behavior was moderated by higher humidity and rainfall (1/4"-1/2") on a lot of the fire area. The fire perimeter is active primarily in the southern divisions, to the south end of Copper Mountains across private lands north of Charleston, NV. Air support was very effective. Fire activity was low to absent elsewhere on the Murphy Complex. The Murphy Complex was divided into two zones and will be managed by two incident management teams beginning this morning. 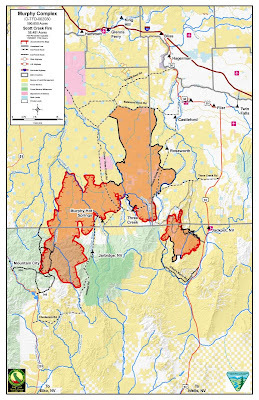 Castleford Zone is the northeast portion including the Scott Creek Fire and most of the fire on BLM Idaho lands. The Wild Horse Zone is the southwest portion primarily on National Forest lands. Operations will include patrol and mop-up (150' to 200'), direct and indirect fire line construction, and surveying the dozer lines for effective rehabilitation. Also, firefighting resources will be immediately available for initial attack, should the need arise. Aircraft with infrared technology will fly over the fire today, mapping the hot spots within the fire area and looking for any new fires caused by lightning. The fire is expected to be most active today in the south and southeast possibly moving towards the Charleston Reservoir and Jarbidge Wilderness Area. Evacuations have been lifted for residents in all areas. Many roads in the area remain closed to the public. Idaho Power has restored power to Jarbidge and Murphy residents. Emergency generators have been installed in Owyhee, Mountain City, and Duck Valley. Raft River Electric Company has begun repairs to Duck Valley Indian Reservation. Stage 2 fire restrictions have gone into effect today.